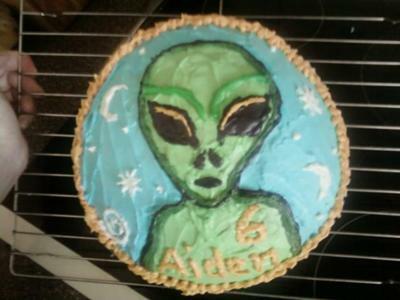 I made this Alien cake with just a packet mix vanilla cake. I mixed the supplied icing with extra icing sugar and some water, and divided it up for coloring separately. Believe it or not, all the drawing with icing was done with a toothpick! I just placed some icing on the end of the toothpick, and let it stretch out as I created the picture.